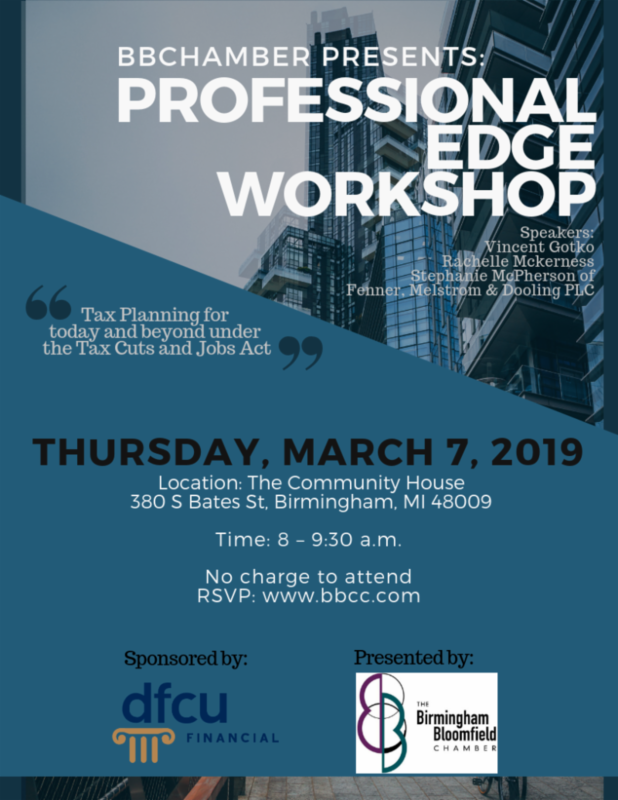 On Thursday, March 7, Birmingham Bloomfield Chamber will present a Professional Edge Workshop on Tax Cuts and Jobs Act at The Community House, located at 380 S Bates St. in Birmingham. The workshop is scheduled from 8-9:30 a.m. and includes a continental breakfast. The BBChamber Professional Edge Workshops are sponsored by DFCU Financial and are interactive events focused on strengthening businesses. The Tax Cuts and Jobs Acts was approved by Congress in late 2017. Attendees will be informed on the most common and meaningful provisions of the act, the impact those provisions have on individuals, corporations and flow-through entities, and some potential planning opportunities for consideration. A range of speakers will be present for the workshop including Vincent Gotko, Rachelle Mckerness and Stephanie McPherson, all of Fenner, Melstrom and Dooling PLC in Birmingham. There is no charge to attend, however, space is limited. To register, please visit www.bbcc.com or call (248) 644-1700.